This is an In Person signed Colour 10" x 8" Photograph by the American film actor and comedian. 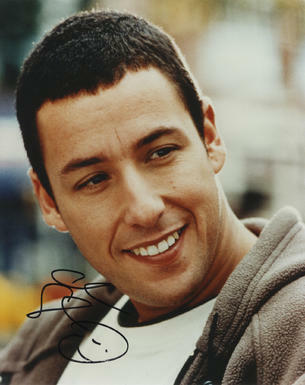 Adam Richard Sandler (born September 9, 1966) is an American actor, comedian, screenwriter, musician, and film producer. After becoming a Saturday Night Live cast member, Sandler went on to star in several Hollywood feature films that grossed over $100 million at the box office. He is best known for his comedic roles, such as in the films Billy Madison (1995), Happy Gilmore (1996), The Waterboy (1998), Big Daddy (1999), and Mr. Deeds (2002), though he has ventured into more dramatic territory. In 1999, Sandler founded Happy Madison, a film and television production company that has produced numerous films and developed the 2007 television series Rules of Engagement.